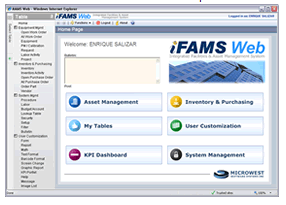 iFAMS integrates Assets, Service Request management, Labor, Service Contractors, Maintenance, Refrigerant Tracking, Tenants, Parts Inventory, Purchase Orders, Vendors, Budget Accounts and more. iFAMS is designed to give you detailed activity history information enabling you to track, plan and manage your facility efficiently. iFAMS is fully scalable, all the way from single or few-user systems up to large Enterprise-wide SQL Server and Oracle based systems.